Photo: Walnut Grove, ca. 1765, Route 1, Roebuck, SC. 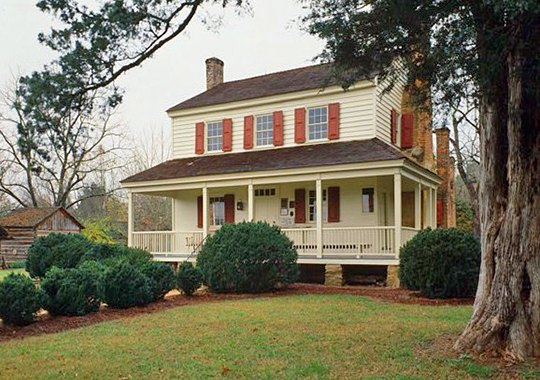 The Walnut Grove Complex reflects the migration of Scotch-Irish settlers from Pennsylvania and Virginia who established subsistence farms in the South Carolina upcountry. Listed on the National Register of Historic Places in 1970. Photographed by Jack E. Boucher, 1987, Historic American Buildings Survey [HABS SC-616], memory.loc.gov, accessed April, 2014. Spartanburg County Administrative Offices are located at 366 North Church Street, Spartanburg, SC 20303; phone: 864-596-2526. Spartanburg County was formed in 1785 and took its name from a militia regiment who had called themselves the "Spartans" during the early years of the American Revolution. By 1789 settlers had moved into the area in sufficient numbers to warrant the construction of a courthouse and jail. The site selected was a crossroads settlement which later became known as Spartanburg. The early log courthouse was constructed in the middle of the public square which later became known as Morgan Square. Philip Thomason, Anne Meyers and Nancy Tinker, Thomason Associations, Spartanburg Historic District, Spartanburg, SC, nomination document, 1982, National Park Service, National Register of Historic Places, Washington, D.C.